Less than three months before world leaders will meet in Mexico in attempt to negotiate a new global deal on climate change, leading finance executives came together in Mexico City, under the umbrella of the United Nations Environment Programme Finance Initiative (UNEP FI). The Bankers Club of the Mexican Banking Association (ABM) hosted 55 senior finance executives who exchanged views on the finance sector’s role with regard to climate change solutions. 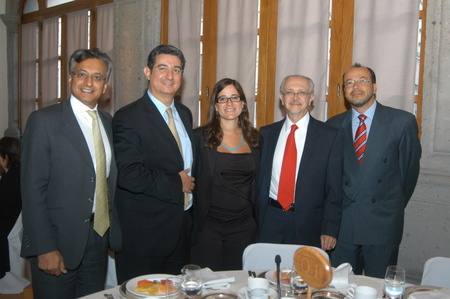 The event was co-organized by the UNEP Finance Initiative, the Mexican Banking Association and the Mexican National Institute of Ecology, and was moderated by Jessica Jacob, UNEP Finance Initiative Latin America Task Force Coordinator. Nobel Laureate Dr. Mario Molina delivered the keynote address, urging the finance sector to increase investment in renewable energy. ‘The private sector has to see the real business and investment opportunities and learn from the existing best practices to accelerate progress. There is no one magical solution. We need to take different simultaneous actions, such as investing in solar and wind energy’, he added. Dr. Mario Molina’s research on chlorofluorocarbon gases and their threat to the ozone layer was acknowledged in 1995 when he received the Nobel Prize for Chemistry. “Dr. Molina’s leadership has never been more welcome or needed”, said Paul Clements-Hunt, Head of the UNEP Finance Initiative. “Weeks separate the world from the critical moment when world leaders will meet to find new and transformational agreement on addressing climate change. In these critical weeks, our Member finance institutions should demonstrate that, through their commitment to invest in a clean-tech low-carbon economy, solutions to climate change indeed are possible”, he said. “In terms of the environmental challenges that we face, not everything is bad news’, said Luis Robles Miaja, President of the Mexican Banking Association. “Occupied with the issue of climate change to the same extent as the general public, banks and other financial institutions have shown a tendency of developing and adopting pro-active and innovative strategies to exploit the commercial opportunities associated with sustainable development. This has lead to the inception of new products and adoption of internal decision-making procedures, such as creating low-carbon investment funds, loans dedicated to environmental projects, as well as the consideration of environmental risks. ” “In advance of COP16, today we have the excellent opportunity to discuss how enhanced private capital flows can play a crucial role in addressing climate change, said Abyd Karmali, Managing Director and global head of carbon markets at Bank of America Merrill Lynch, which is a bank Member of the UNEP Finance Initiative. “During this period of investment uncertainty, while the UN negotiations continue to take their course, the financial sector needs to work with governments to help design smart policy instruments that can lower the risks to equity, debt, and carbon finance providers.” “An international accord is necessary, as well as establishing a price on carbon emissions, increasing international cooperation and resources allocated to research and new technologies. Climate change is the most urgent problem of our planet. We all need to get involved – governments, private sector and society”, concluded Mario Molina. The National Institute of Ecologyis a decentralized agency of the Ministry of Environment and Natural Resources (SEMARNAT) and a leader in applied environmental research that develops and promotes scientific cooperation projects, economic analysis and public policies that may contribute to solving major environmental problems of Mexico. The Institute supports conservation and environmental restoration throughout the country. On climate change, the INE made national emission inventories and national communications to the UNFCCC. Its researchers participate in international negotiations on this matter. Towards the COP 16, the INE is responsible for the academic subcommittee activities, among which are holding events for capacity building at the COP.